Chaos corrupts everyone eventually and we all know that the Astral Claws were no different. You either die a hero or live long enough to become the villain, so lets take a look at those villains. Even though I have been working on and off on my Claws for around 3+ years now I still have never made one of their dark counterparts, the Red Corsairs. 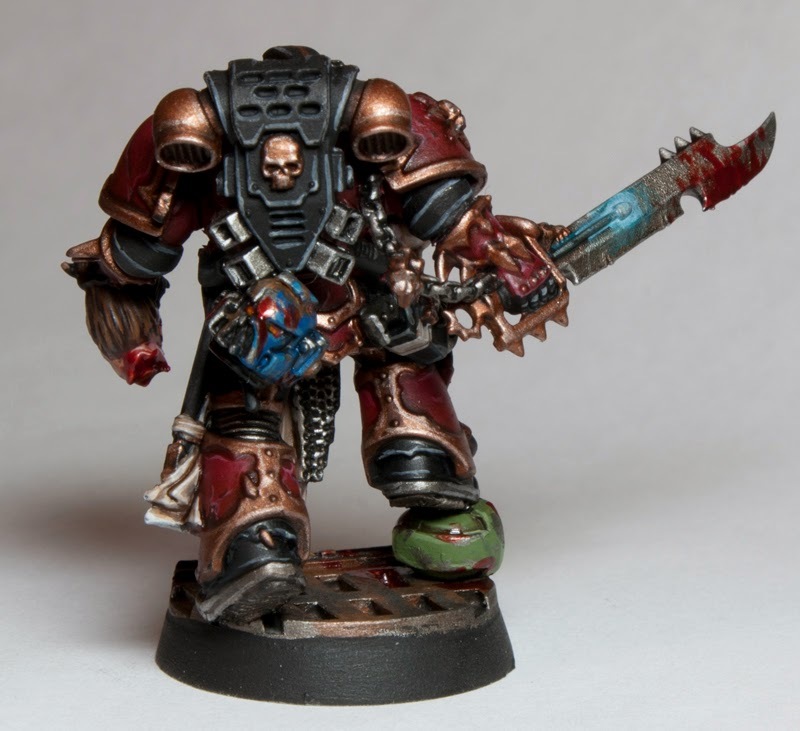 Well a few weeks ago my (at the time) local Games Workshop in Austin ran a painting competition. I found out about it only a few days before and went into the store 2 days before it to ask about the specifics. All of my Golden Demon entries were on display at that store and the manager said I had a whole slew of models to chose from to enter. I didn't want to reenter something from a national competition into a small local one though so decided to take the opportunity to whip up something new. I had the basic idea for this guy for awhile so I had some framework to go off of. I did the conversion in 3 hours on the same day I went to GW. 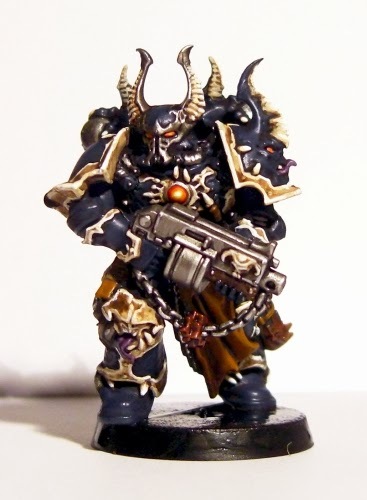 The basis is the chosen model from Dark Vengeance carrying just a boltgun. This was hacked apart until all I had were the legs and the back of his torso. 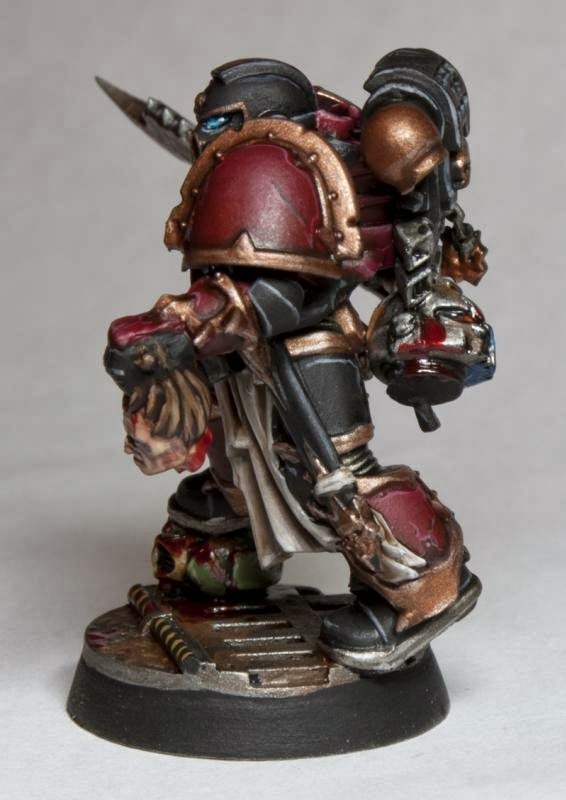 The front of his chest is from the Khorne Bezerkers box and was essentially the kernel of my idea. To me it really says Space Marine pirate by having a bandolier of shells slung across your body. The arms and power sword are from the Raptors box and the head and backpack are from the new Tactical Marine box. 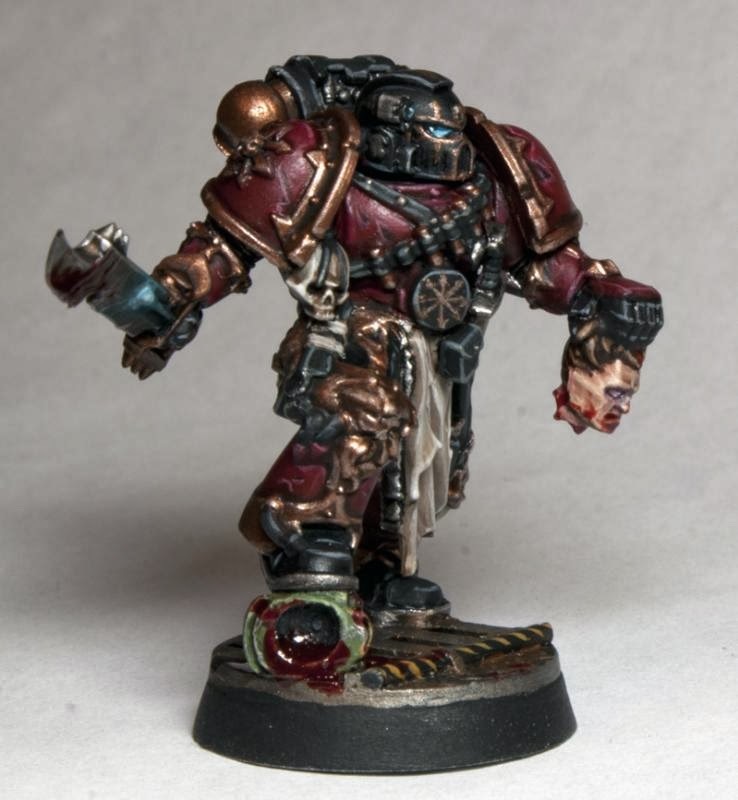 I used them to retain some of the loyalist elements to his armor to show how the Corsairs are relatively new converts to chaos as well as scavengers. That helmet could very well be his own from when he wore the colors of the Claws or could have been torn from a fallen enemy to replace one that was to damaged. The hand holding the head was the most involved and came from the Fantasy Warshrine of Chaos model. Not only did I have to take an unarmored hand and make it armored, I also had to switch it from a right hand to a left hand. In the end I cut off most of the existing detail on the hand and sculpted a new thumb, the armor on top and took the fingers from another marine hand I had laying about which were then blended into the existing model. I also had to re-sculpt his left foot since I had changed the angle he was standing at. With the sculpting done I started painting him the next day and got it done within 6 hours. I opted for a lot more brass on the trim then what is normally shown since I think it makes it look better. 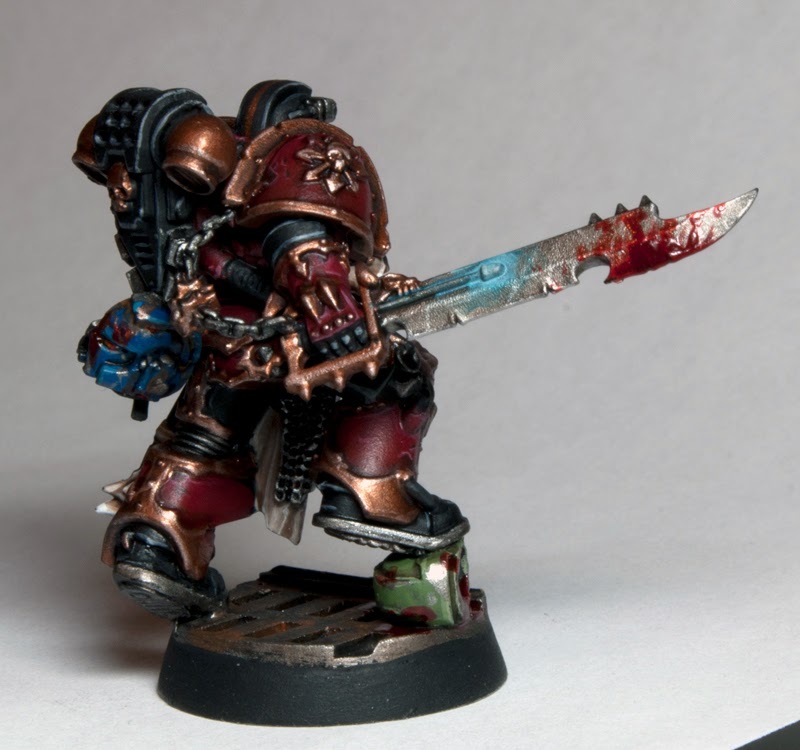 This was also my first time using the new blood effects from GW on the sword and I really like it. I still have to paint the Tyrant's Claw on his shoulder but for the most part he is done. 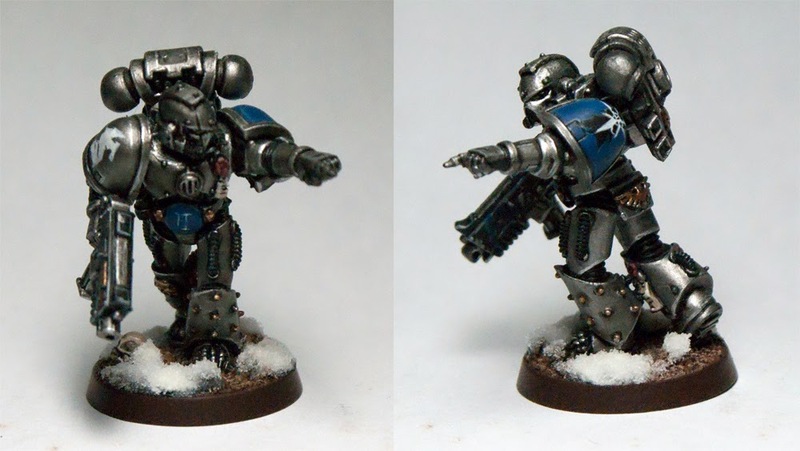 I am really happy with how he turned out and plan on maybe doing a few more to make a small squad. 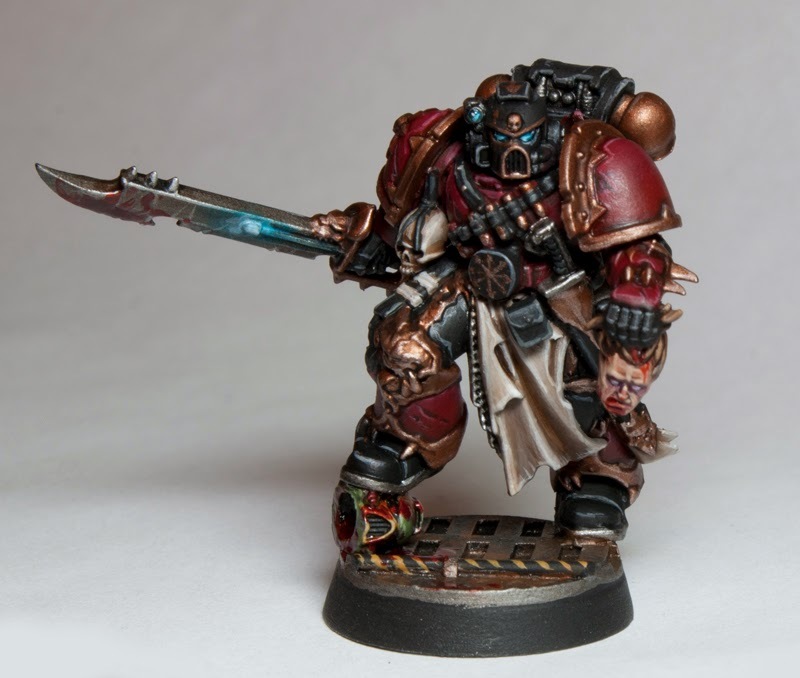 I decided to make this guy Tu, from my Squad Numas, and will probably make the rest of my Corsairs a few of the remaining members who lived long enough to fall to Chaos. Well that's all for now, any comments or criticism is appreciated. Be sure to vote for him on CMoN here. That's the best Claw I've seen yet, superb work! Wow - absolutely brilliant - you've worked those changes in perfectly. I would never have picked some of the conversions you've made. Awesome. How did you do the base? Really great concept - again - brilliantly executed!